This is the 650ml bottle that is is 12.00% ABV making it about 345 calories a serve size and this bottle would be 6.2 standard drinks in NZ. It’s a lager, but definitely not as we know it. Triple Day of the Dead. Black lager inspired by the Aztec beverage xocolatl – this batch brewed extra strong with smoked chipotle chili, cocoa and agave, then aged for over a year in freshly emptied Tequila barrels, and finished on raw cocoa nibs. Incredibly rich and dark, Triple Day of the Dead possesses a uniquely complex mix of spice, oak, smoke chocolate and restrained chili heat. Intense cocoa/chocolate aroma on opening, That’s already a winner. Pour seems very thick and viscous, and it is pitch black with a coffee tinged head that looks full firm and steady. There is a lot of cocoa/coffee in that aroma in the glass, it’s intense alright. Brilliant full wrap table art, wonderfully detailed and in glorious colours, that’s like sparkling things to a magpie. That a full on surprise. Pitch black pour with intense aromas of cocoa/cofee. Taste has an astringent from the tequila but there’s so much softness in there to cushion it. Finish is a splash of that alcohol, and a big wallop of dry oakiness. 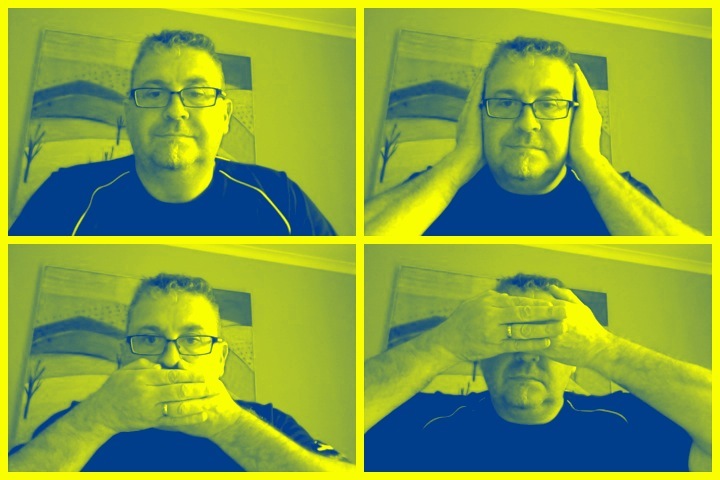 Then as you ponder that there’s the chilli heat under all the things prickling away….. it’s all on! This is really clever really clever beer of the first order. 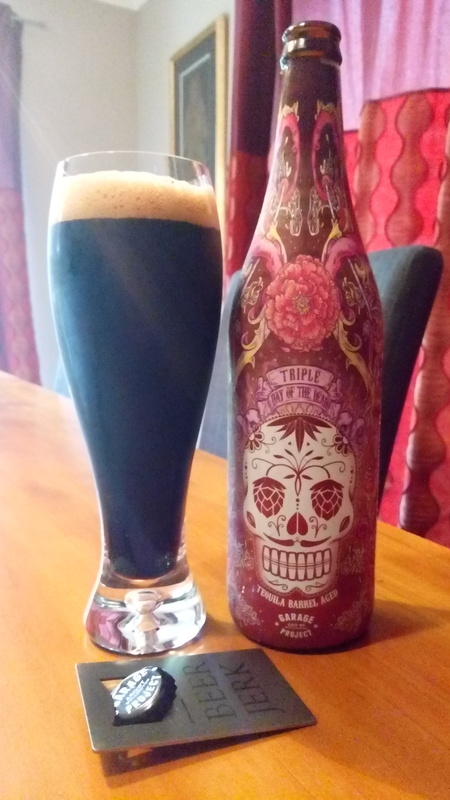 It’s hard to describe just how nice this beer is, and I know that based on the contents, Tequila, Cocoa, Chilli and adding woodiness form the barrel does not sound like a winner but this is spot on. Dead center. Importantly though, that sharpness that I’m giving to the Tequila part is just a point on the flavour, it’s not the flavour, or the distraction, it’s just one of the interleaves of this, a thread to the whole. What’s really surprising is that there is no hint at all of the alcohol content in this, it is muffled and hidden by the wonderfully balanced and in tune flavours they’ve managed to combine. Man could get quite emotional about a beer like this, particularly one that doesn’t come around that often. So to recap, a pique of sharpness (lets call that the tequila) then a blanket of the cocoa which is lovely soft and smooth, the woodiness…. the pause, then the prickle of heat. I just don’t know how else to tell that story, this is a giant of a beer. And as I get close to the end point this is the kind of beer that I hoped I’d get to. The pdubyah-o-meter rates this as 10 of its things from the thing. Honestly it’d be churlish to mark this as less than that, despite the fact that I didn’t give it 5 stars on the other apps that I use (Untappd and Ratebeer) this isn’t about that, this is after all the Pdubyah-o-Meter, and even if I think this doesn’t score all the points there, right now, today this is one of the finest beers that you could hope for in this style. It’s that good. Would I share with a friend on a porch and set the world to rights? Yes, but they’d need to be a really good friend as this is rather good and comes in a single serve container 🙂 This is spectacular beer of many level and would hold court and hold it’s own against anything you stand against it, and if it falls short then it falls short to a Giant. If you want to listen to someone who can properly sing this is a good start. Listen Without Prejudice Vol. 1 is the second solo studio album by the English singer George Michael, released on 3 September 1990 and recently re-released. Dark brown to black. Medium body. Roasted malt evident. Low sweetness in aroma and flavor. Low to medium bitterness. Low bitterness from roast malt. Hop flavor and aroma, “noble-type” OK. No fruitiness, esters. 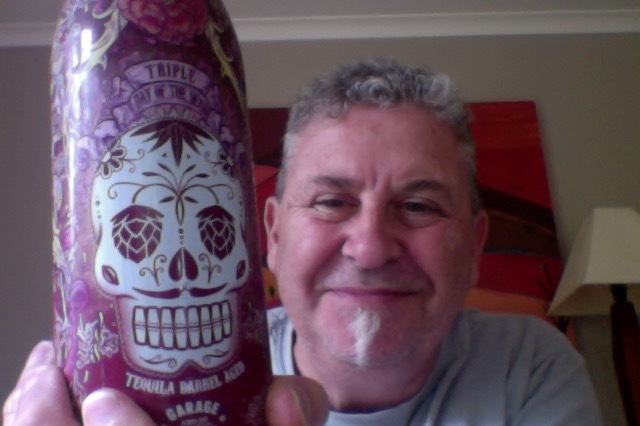 This entry was posted on October 28, 2017 by Philip Walter in Beer, Beer of New Zealand, Beer Review, Craft Beer, Critic, Garage Project, Schwarzbier and tagged Beer, craft beer delivery, Day Of The Dead, Garage Project, Schwarzbier, Tequila barrel aged beer, Triple Day of the Dead.